Don Klein, president and CEO of Mercy Health Youngstown, stands with Jim Tressel, president of Youngstown State University, following a press conference yesterday morning in Kilcawley Center’s James Gallery announcing a 10-year agreement between Mercy Health and YSU. 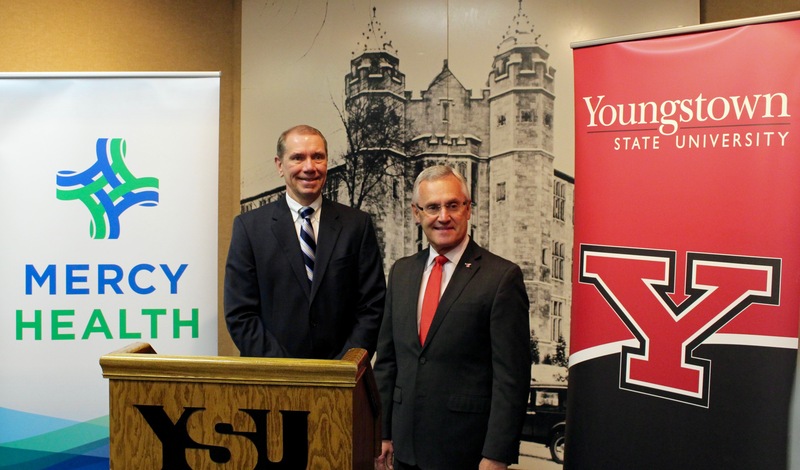 Youngstown State University and Mercy Health announced a 10-year partnership on Wednesday that they said will improve student health services and increase academic opportunities for students. Mercy Health will begin operating the Student Health Center on campus next month and will participate in the creation of the university’s master of athletic training degree program, which is the state’s first. They will also collaborate with YSU Athletics and work together to develop regional economic development initiatives. 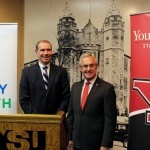 “I think any time some of the biggest institutions and impact players in the area can get together and collaborate to make it even better is huge,” YSU President Jim Tressel said. He noted that Jim Greene, a former member of the YSU Board of Trustees that passed away recently, had pushed for the partnership. Don Kline, president and CEO of Mercy Health Youngstown, said this builds on an existing relationship, which has included YSU students receiving clinical training through Mercy Health among other collaborations. “We at Mercy are equally excited about this opportunity both current and future to partner with YSU in ways that will benefit not only the students and faculty, but also local business interests and the broader Youngstown Community,” Kline said. Jim Kravec, president of Mercy Health physicians, said the partnership helps the organization meet its goal of increasing access to health care. Kravec said three Mercy Health physicians will be working in the campus health center, including Jessica Handel, who will serve as the center’s medical director. Tressel said the university needs to increase awareness of student resources like the health clinic. Eddie Howard, vice president of Student Experience, said they would like to expand the care offered in the future, possibly expanding the hours of operation or providing care to faculty and staff. He also said there will continue to be opportunities for students to work in the health center.